Stories about familiar subjects are the stuff of good documentaries, but in our busy times they’re the bane of strong product videography. 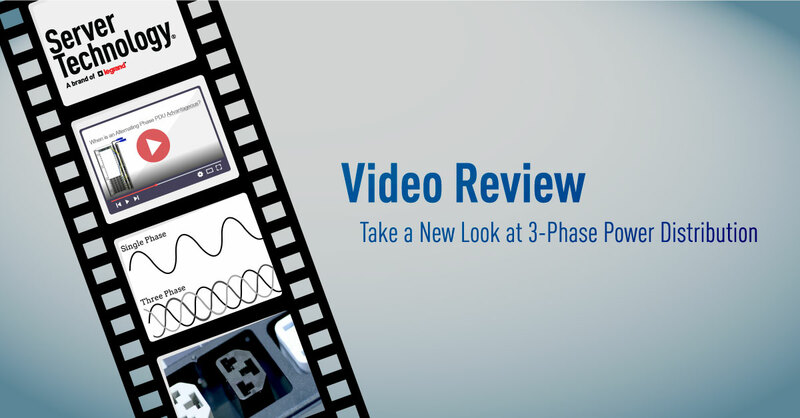 In the upcoming ‘Take a New Look at 3-Phase Power Distribution,’ a lone narrator takes the helm of Power Expert Theater to lead the audience through a thoughtful video short that tackles the existential questions of power distribution: when do you, and when don’t you, use a 3-Phase PDU? The audience is greeted by the voice of Linda, our mononymous hostess and narrator. Like other one-name leads such as Cher, Madonna, or Sade, Linda’s voice is strong and authoritarian, yet winsome and encouraging when she needs it to be. Supported by the screenwriting talent of the Server Tech Engineering team (thanks, guys! ), it is Linda’s voice that guides us through a series of twists that challenge our perception of the familiar subject, 3-phase power. At the outset, she invites the audience to ‘kick back and learn something new,’ an invitation that this author accepted with anticipation. The video quickly delves into its subject matter. It includes an overview of familiar three-phase receptacles, those most often seen powering cabinets in the data center, as well as some background on the importance of load balancing. The focus of the narration then shifts to conventional three-phase rack distribution, and then finally to the star of the show: Server Technology’s alternating phase 3-Phase PDU. And while it is easy to create great videos on star power alone, a short word about the cinematographic style of this latest release, which alternates effortlessly between technical renderings to full-color photographs of actual installations. It has a spare visual language reminiscent of Emmanuel Lubezki’s cinematography for “The Revenant.” The unnamed cinematographer in this video offers a master class in minimalist screen craft, giving us untamed, ridiculously long server cables set against a plain white expanse. Just as everything depends on the power connection between server and rack PDU, everything in the product video genre depends on the supply of information, which in this case, is abundant. In the background you hear Linda ask simply, “so when don’t you use an alternating phase PDU?” This is a bold and unselfish question asked by the narrator, and one that will have viewers from the industry thinking that Server Tech is steering you away from their rack PDUs. It is an innovative turn, and one that that is guaranteed to pique the audience’s interest. When not, indeed. This is not a sales pitch, you think. What a relief. Could other manufacturers be so bold? When Linda finally gets to the question, “then when do you?” you are steered back to deeply charted Servertech territory. The benefits, of course, are many, and, needless to say, HDOT enters the storyline and plays a dramatic role in the outcome of the narrative. It is this portion of the story that left this critic only slightly disappointed. Is the HDOT really the be all, end all of Server Tech’s work? Can they continue to rely on it as the conclusion to every rack PDU story? As if on cue, it was at this moment in the video I was reminded that I was in the hands of a product video artist. At this moment of doubt, the moment I thought I’d seen it all before, Linda poses yet another existential question. She asks, “Does it get any better than that?” Spoiler alert: it does. And how. We will leave the rest of the story for the viewer to discover, but let me say simply this may be one of the greatest endings ever to a story told about a rack PDU. If the Academy calls, you know who my vote for best Product Video Short will be. To get a look at the video, click here. And enjoy.